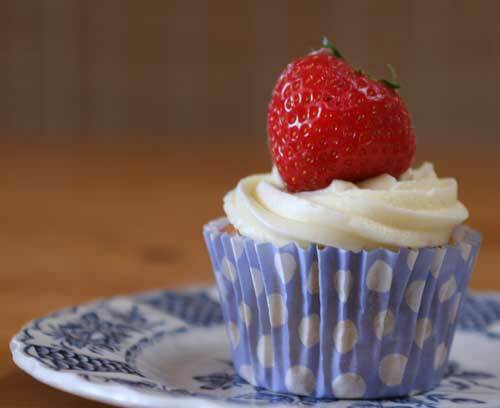 Alchemy in the Kitchen: Strawberry and Orange Cream Cheese Cupcakes – the 3-second rule applies ! 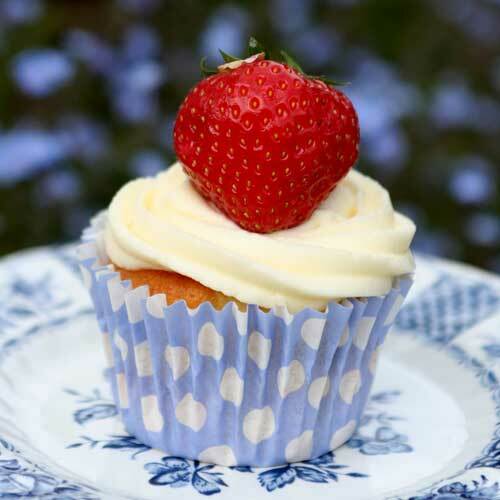 Strawberry and Orange Cream Cheese Cupcakes – the 3-second rule applies ! When my sister got married, she made a special request. Would I please, please, please make “that amazing carrot cake with the cream cheese frosting” as her wedding cake. While I’d never made a wedding cake before, I was delighted to oblige. Strawberries and Cream Cheese - the perfect marriage! The project got off to a bad start... As I was transferring the largest of the cakes into the oven, the base fell out of the tin, dumping batter all over the bottom of the oven... the floor... my shoes... I made up some new swear words that day. The hours to the wedding were ticking down so I rolled up my sleeves, gritted my teeth, and started again. By next morning, the three tiers were baked and frosted. Before the ceremony, I went to the hotel to set up the cake. I had my list: Cake boards ... ü Ribbons ... ü Dowels ... ü Pillars ... ü Roses ... ü It was like a mini-construction site, complete with landscaping. With the multi-storey cake set up and refrigerated, I went off to the ceremony, much relieved. Job done! ﻿Thankfully, the cake made it through the photos. I had turned back to chat to my fellow guests when I heard a collective gasp, followed by a soft thud, as if someone had fainted. I refused to look and moments later, the groom tapped me on the shoulder. “Great cake, Hester” he said, “but the engineering skills need work!” Ooops! The light fluffy carrot cake just wasn't up to the task of supporting several kilos of pillars, and frosting, and roses and the layers of cake above it. (Doh!) Luckily there was enough in the surviving tier for everyone in the room. Funnily enough, there was no sign of the fallen cake when the hotel staff arrived to clear it up. I have a sneaking suspicion that the 3-second rule was employed by the hungry boy children in the room. Lower fat cupcakes: "Does my bun look big in this?" For the most part, I’ve stuck to single-storey cakes since then, but my love of cream cheese has grown so much that as well as using it for frosting, I now put it in various cake batters in place of butter. It adds a whole new flavour dimension as well as cutting the fat content dramatically. Butter is about 81% - cream cheese is around 23%. 1 In a mixing bowl, whisk the Philadelphia together with the sugar until smoothly blended. Add in the eggs and the orange zest and continue whisking until well combined. 2 Sprinkle in the flour and baking powder and continue whisking until the flour is incorporated into the mixture. 3 Divide the mixture between the 12 cupcake papers and transfer to the preheated oven. 4 Bake for 18 – 20 minutes or until risen and evenly golden. 5 Remove from the oven and transfer to a cooling rack. Leave to cool completely before piping on the frosting. 6 In a mixing bowl, whisk the Philadelphia together with the butter then slowly add in the icing sugar, whisking continuously until all the sugar has been incorporated and the mixture is smooth and thick. Transfer to a piping bag with a large star nozzle and refrigerate until needed. 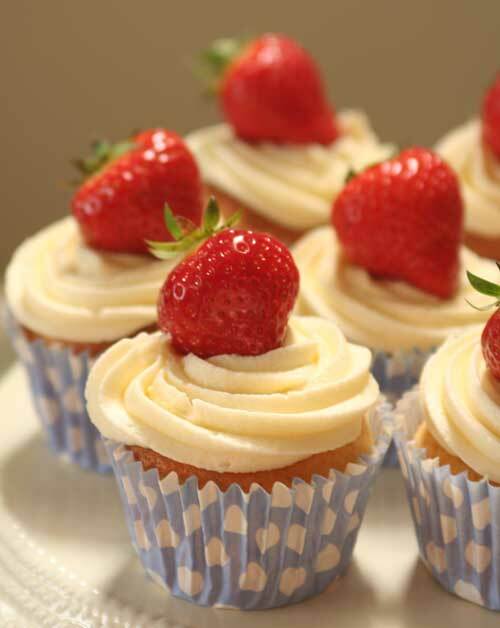 7 To finish, pipe a swirl of frosting onto each cupcake and top with a fresh strawberry. Apply to face. Grin happily! Great story, the wedding cake was certainly memorable and those kids had the time of their life - unrestricted and almost unlimited access. This does not happen everyday! I am definitely going to try these. My little one ADORES cupcakes and these are much healthier than "regular" cupcakes! Love them! Hehehehe I have never made a multi tiered cake... tooooo scared! But I am sure it tasted delicious! Love your cupcakes. They sound just perfect! I loved your story! One time when I was in high school my neighbor paid me to make a s'mores cake for her daughter's birthday and it was rough. The cake was heavy, leaning and I was so afraid it wasn't going to make it! Anyways, I love cream cheese frosting but I had never thought to use cream cheese in place of butter in my recipes. What a great idea!! Your photos are beautiful as well. Love that you did your sister's wedding cake! I just promised to make one for one of my oldest friends and it has me a little freaked out...The cake sounds like it was delicious - I'd probably have applied the 10-second rule. Three sounds about right for these cupcakes though - yum! Love your story...I could just feel ya! These look wonderful---can't wait to try em!!!YUMMMO!! Hester, you're definitely my favorite food writer. I always smile when I read your post. Love your colorful and delicious cupcakes. I'd better start using cream cheese instead of butter to see how the 3-second rule applies! Cheers!!! The idea of cream cheese frosting on a wedding cake is AMAZING!!! I'm picking out my wedding cake this weekend, I'm going to totally ask them can they do that!!! These are gorgeous! I love orange and cream... the strawberry is such a lovely addition! Your cupcakes are so pretty with the strawberries on top! Great idea on swapping cream cheese for the butter, I'll have to try that out. Does the cream cheese provide enough moisture? @Hazel - Hi, yes - at first it was a total experiment and I was afraid they'd turn out like biscuits/cookies but they were light and delicious and definitely had enough moisture. Sorry about the wedding cake! So glad there was enough left over for everyone to taste your delicious creation! Your cupcakes are beautiful! My favorite frosting, too! 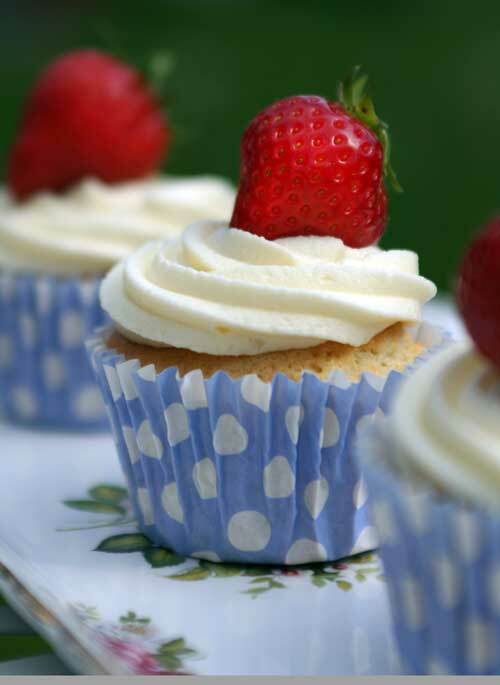 strawberries and cream are certainly a perfect marriage.I great attempt on these for die for cupcakes and the wedding cake sounds interesting. Helloooo, I've been thinking today & I also think this frosting will be absolutely delicious with an old fashioned ginger cake!! After your story, I think I'll stick with a single tiered cake from now on (not that anyone's asked me to bake their wedding cake :)). What a great story! I'm so impressed that you would take on such a tremendous challenge. What a loving thing to do for the happy couple, and it worked out in the end. You had plenty of delicious cake for everyone! @Mrs Chief - liking that suggestion. It would be perfect with ginger cake and a lovely colour contrast. Thanks for sharing this wedding cake story, quite an adventure that was for sure. The cupcakes look so scrumptious! I added my own gasp as I read that story. What a memory for that day!! I imagine you will be hearing about that cake for the rest of your days :-) I love the cupcakes. Orange and strawberry is a perfect combination for this time of year. Wow - I am SERIOUSLY drooling!! I came right over as soon as I saw you on Top 9, Hester... CONGRATS!! I love cream cheese frosting and orange cake, but I have never had the cream cheese as a part of my batter! They look delicious and definitely worth a try! Beautiful cupcakes and great story! I was biting my nails as I read along. :) You were very brave to even attempt baking your sister's wedding cake. I admit, I probably eaten it off the floor too since I love carrot cake so much. ;) Don't tell anyone. Great idea to swap cream cheese with butter, I'm going to try that! Oh my goodness!! What an adventure! At least your cake did make it for the photos, and I bet it was a lot of fun for people to help "clean up" the mess. :D I think the 3-second rule would most definitely apply! these look amazing and the strawberries made a great final touch!!! Beautiful cupcakes Hester! And great story about the wedding cake- we have a 5-second rule around here! such cute liners! i love polka dots...hehe. I must be a sadist, because I want to see pictures of the fallen wedding cake! What pretty little cupcakes. Love the polka dots and perfectly piped icing! A wedding cake is a major endeavor! There may have been a few adults who also applied the 3 second rule. Hello! I'm meandering over from Mike's picnic at The Culinary Lens. Wonderful wedding cake story! I'm grinning over that and your delicious cupcake and frosting recipe!